If you can't already tell, I'm huge advocate of logging user activity. There's something incredibly powerful about understanding what people did in the past. I guess it harkens back to my days as a high school history teacher where I would tell everyone on the first day of class that students who fail my class are doomed to repeat it. One interesting solution that I've been playing with is capturing events in Salesforce orgs and sending them over to Heroku. 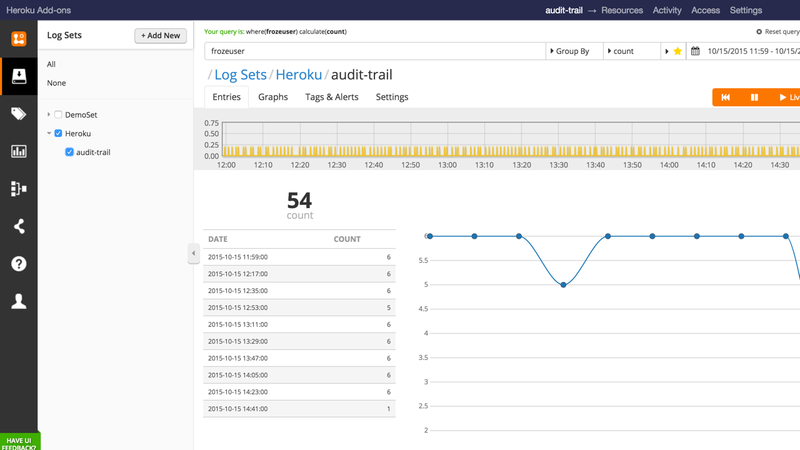 If you haven't heard of Heroku before, you should check it out. It's a platform for developers to effectively deploy and manage their applications. One of the great advantages of Heroku is it's great add-on platform called Elements. Whether it's cache, video processing, data storage, or monitoring, it's easy to plug Heroku apps into a great ecosystem of app providers. 1. I created a polling app that runs on Heroku. In my case, I created a python script that polls Salesforce every minute to retrieve Setup Audit Trail events. But it could just as easily captured Login History, Data Leakage, Apex Limit Events, or really any object accessible via the Salesforce API. 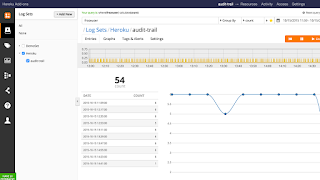 Heroku's LogPlex only persists the last 1500 events and can be lossy since it was really intended to be used for logging performance trends rather than security events like escalation of privileges. the polling app will count against API limits. 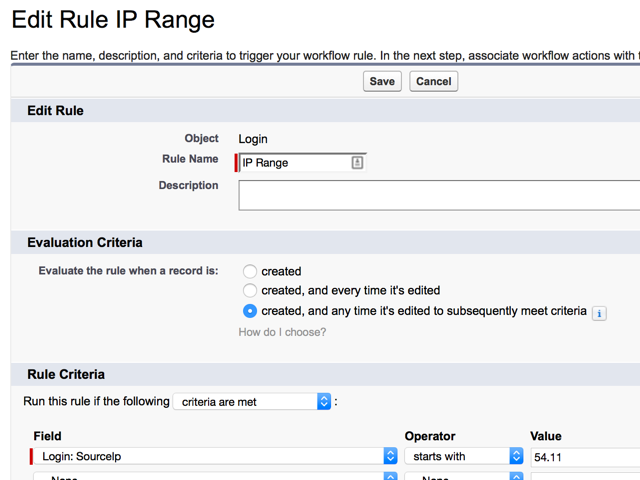 If it polls every minute, it will cost you 1440 API calls per day. To try this solution, check out the sample Setup Audit Trail python script on my Github Repo. As a Salesforce administrator, have you ever spent to much time researching security for your cloud applications? Ever felt frustrated trying to find the security setting you need? That's why Salesforce created the Security Health Check, available to you in Spring '16 release. Difficulty understanding and staying up-to-date with everything security related and how it relates to your business and cloud applications. 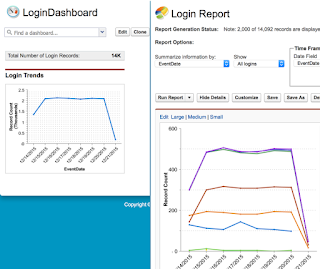 Security Health Check shows an overall score reflecting how well different security settings in your Salesforce application meet the Salesforce standard baseline. This baseline is the Salesforce recommended practice for implementing highest level of security. The typical Salesforce "org" has about 20 different security nodes in Setup. Each node consists of many different security settings. We've simplified this experience by elevating popular setting groups to the Health Check page. We evaluate each setting's security implication, its implementation, and apply proprietary risk scoring and weights to each security setting. What’s Next for Health Check? In Setup, find Security Health Check by typing "Health Check" in the Quick Find box to find it under Security Controls. We hope you use the Health Check and that it becomes a favorite security destination for you. Please feel free to leave your comments, suggestions and feedback below. Thank you! 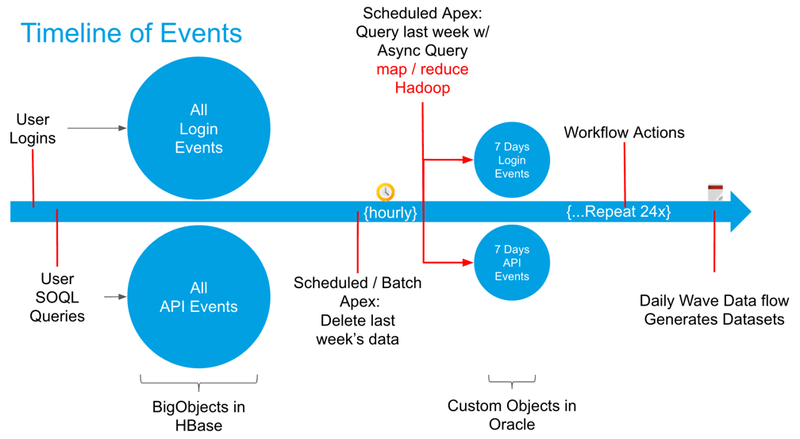 Working with BigData requires re-thinking how you work on the Salesforce platform. Since you can assume that you're working with billions of records instead of thousands or even millions, common tasks like aggregate functions (e.g. SELECT count() FROM LoginEvent) or complex queries (e.g. SELECT username FROM ApiEvent WHERE Soql LIKE '%SSN__c%)) are difficult to perform quickly. By quickly, a SOQL query needs to typically complete within two minutes or it will timeout. As a result, it's better to think of BigData as a data lake, where massive amounts of data can be processed at scale to meet any of the above use cases. 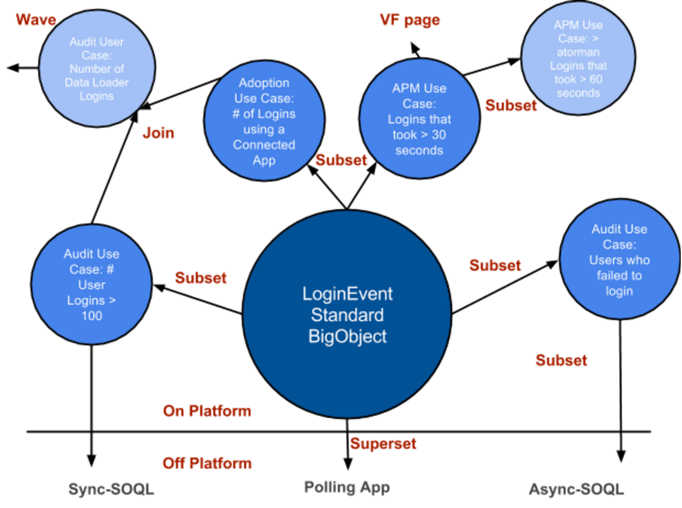 In a more concrete case of user login events which we now store in the Salesforce equivalent of BigData called a BigObject, it becomes important to re-think how you can work with the data at scale. 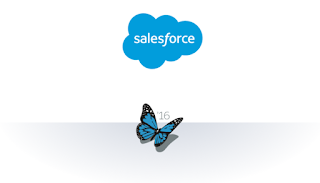 This is especially important since not all capabilities that we've come to expect on the Salesforce platform, like operational reports or workflow, may be possible with a BigObject. It's a trade off of scale for limited platform capabilities. For instance, rather than querying a BigObject like LoginEvent using a convention like synchronous SOQL via the API for use in real-time applications, it's better to use a new convention called asynchronous SOQL, currently in pilot, for extracting select use cases with analytic apps. Asynchronous SOQL is similar to the Bulk API in the way it's job based and invoked using the API. But instead of the full CRUD capabilities with Bulk API designed primarily to work with the data off-platform, asynchronous SOQL provides a query-and-insert capability to retrieve sets of data and insert it into a structured object. Currently, this means moving data between BigObjects and custom objects on the platform. 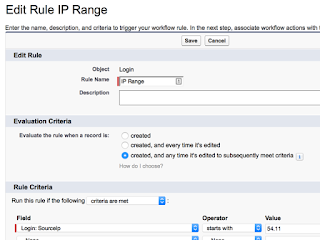 For instance, you may want to create a subset set of data hourly, daily, or weekly in order to have the full transactionality of the Salesforce platform at your fingertips. Using this design pattern, we can utilize schedule and batch Apex to migrate subsets of data from a BigObject into custom objects. For instance, the ability to extract last week's worth of LoginEvents in order to report on it. 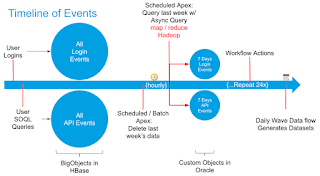 Asynchronous SOQL provides a new way of interacting with large sets of data on the Salesforce platform. For Event Monitoring use cases, it brings us closer to the kinds of analytic apps that enable CISOs and VPs of IT to understand the state and health of their organization. To try this out, contact your Account Executive to have the Asynch SOQL pilot enabled in your org. Then just download the sample code and configurations in my Github asyncSOQL repository to get started with Event Monitoring use cases like Login Forensics, Data Leakage, or Apex Limit Events.